King Louis XV (the beloved) set these questions forth as a challenge to all the philosophers, holy men, mystics, scientists of the world. He offered a life-sized solid gold apple as reward to anyone who could prove to him that they existed and were not simply a figment of his imagination. For four years, men and women from all over the world attempted to prove that they existed to him. In every case, it went something like this, “I may touch you sire, you by feeling my touch, prove that both you and I exist. The touchier and the touched!” King Louis XV would simply say, “Perhaps I am just imagining or dreaming that you are touching me.” This was his answer to every claim. Over and over, it continued until in 1647, when a philosopher / mathematician named René Descartes came to the King’s Chamber and offered three simple words, “Cogito, ergo sum” which translate to – “I think, therefore I am”. King Louis XV was impressed to say the least. If someone were thinking, truly thinking, he could not be the one imagining them, and since the King had not thought of it himself, how could he be imagining someone thinking of it? By this logic, Descartes, and the King must both be real! 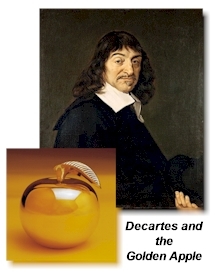 The King was overjoyed and presented Descartes with the Golden Apple. To this day, we still give apples to teachers and the Golden Apple is still used as a lifetime achievement award for teachers! Was it Proof Enough? 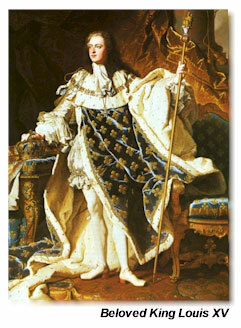 For King Louis XV it was proof enough to merit the prestigious golden apple. On the sidelines however, there were those unsatisfied with the solution. Descartes’ solution required faith. It simply wasn’t the sort of proof scientists’ aspired to. What they needed was an experiment, something which could be done in a laboratory under controlled conditions which would prove once and for all that life was not just simply some sort of dream. So strong has been this debate that it has lasted for almost 300 years, that is, until Heisenberg and the era of Quantum Physics.